"Your attention to details in the planning stages was phenomenal! You paid very close attention to our individual wishes and budget constraints. But possibly the most valuable aspect of your services was your knowledge of the very special lodging accommodations which you arranged for us. They all proved to be special places indeed." 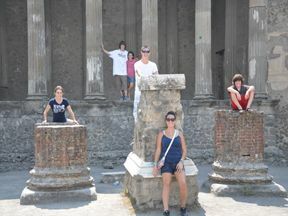 Kevin & Peggy P.
Designing Italy works with great local guides and drivers in many Italian cities such as Rome, Florence, Venice, Siena, Bologna, Pompeii and the Amalfi Coast. In the eternal city of Rome, we arrange customized tours using licensed private guides with reserved entrances for the Vatican Museums, Sistine Chapel and St. Peter's; an amazing walking tour of Ancient Rome that will bring Rome to life with it's rich history of over 2000 years; a special VIP Vatican tour that includes the beautiful Vatican Gardens; walking tours of Italian neighborhoods and even shopping tours. Our licensed private guides and drivers will also take you outside the city of Rome to the ancient ruins of Ostia Antica, Tivoli and Hadrian's Villa. Our customized tours are for your group only and can be 3-4 hours or more and totally geared to the interests and pace of your group. We make all of the arrangements in advance so no waiting in line allowing you to enjoy and make the most of your time. In the Renaissance city of Florence we customize tours for your group with reserved entrance with local private licensed guides. You may choose a three hour tour of "The Heart of the Renaissance - Florence Introduction" including a reserved entrance to Galleria del Accademia to see Michelangelo's "David"; a four hour personalized tour of "Highlights of the Uffizi Gallery and the Oltarno" or we can customize the time as you wish. Our Customized City Tours are a perfect way to enrich your time in the cities whether you are staying for a few days or are on a cruise and have the day to explore. Contact Ginger for more information on scheduling a customized tour for you. Copyright © 2002 - 2017 Ginger Pozzini, all rights reserved.